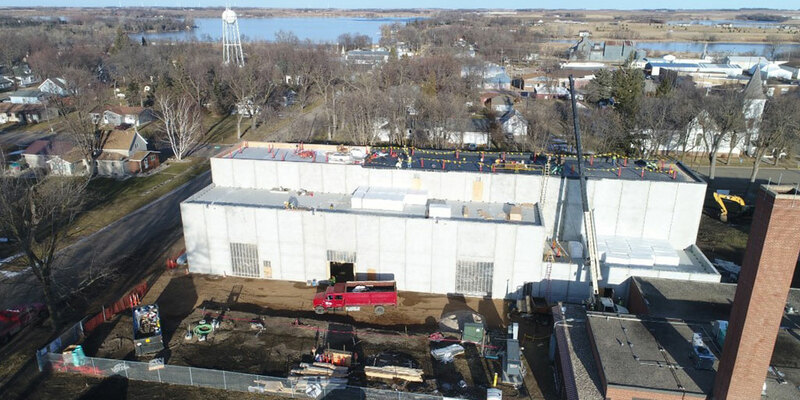 The trū Shrimp Company is raising shrimp in Balaton in western Minnesota and plans to expand its commercial production in nearby Luverne in 2019. The southwest corner of Minnesota, perched on the edge of the Great Plains, is a long way from native shrimp habitat—nearly 1,000 miles in a straight line to the Gulf of Mexico. Raising shrimp as far from saltwater as possible, though counterintuitive, comes with a benefit. The isolation protects the valuable shrimp from pathogens that might sneak in from nearby wild or farm-raised shrimp. “I am completely away from the risks associated with the oceans, and we have total control of our water,” says Jessica Fox, DVM, trū Shrimp’s director of veterinary services and biosecurity, and a 2015 doctor of veterinary medicine graduate of the University of Minnesota. Fox has completed Cornell University’s series of AQUAVET programs as well as the Shrimp Pathology Short Course through the University of Arizona to complement her U of MN education. Four years ago, Ralco beat out 40 other companies to acquire a license for patented technology developed at Texas A&M University to grow shrimp in shallow raceways that mimic tidal flows. Now in its research and development phase, trū Shrimp has created additional proprietary technologies, developed new patents, and are raising Pacific white shrimp, a popular food species, in their indoor research facility. The trū Shrimp Company plans to break ground on a commercial-scale “Luverne Bay Harbor” facility this year. Then comes the big jump—building 10 harbors in 10 years. Trū Shrimp plans to stock each “Tidal Basin” raceway with postlarval shrimp and raise them to 35 grams, the equivalent in retail terms of 16- to 20-count per pound “extra jumbo” shrimp. trū Shrimp hopes to capture a sliver of an American market of 1.6 billion pounds of shrimp each year, about 80 percent of which comes from Southeast Asia and other countries. Because trū Shrimp’s Tidal Basin technology uses recirculated water, it is possible to carefully control conditions and monitor the shrimp for stress and signs of disease. Because the facilities are indoors, trū Shrimp can exclude birds and other free-ranging vectors of disease that can spread bacteria between open ponds. “If any parameter goes out of whack, we can address it immediately. I am really looking to create a preventative medicine approach to raising our shrimp. I want to address concerns before there is a major issue. I want to know when our shrimp are stressed so we can fix whatever is wrong before we have disease,” says Fox. “The focus is on growing healthy, clean, safe shrimp. So, none of the contaminants such as antibiotics or illegal chemicals that are issues right now with shrimp and fish products imported from other countries. And we want that to be done sustainably and in an environmentally responsible way,” she says. Fox reaches out to College of Veterinary Medicine faculty with questions. “They are so fantastic,” she says. It is a partnership she intends to rely upon in the years ahead.